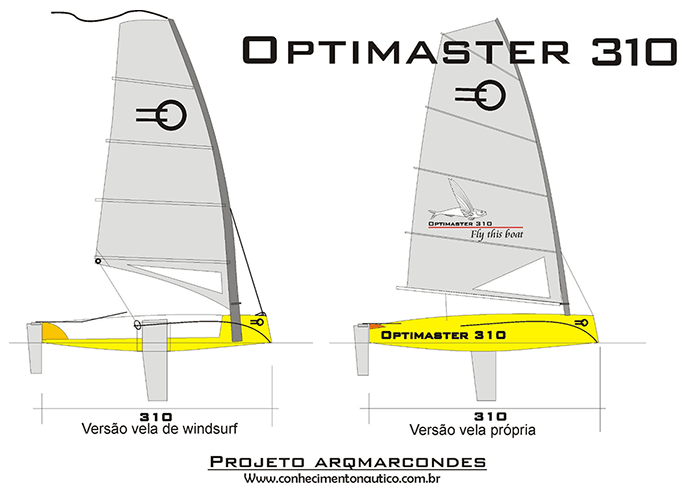 I designed the Optimaster after taking my 10-year-old daughter to sailing lessons at a yacht club in Brasilia, Brazil. Not surprisingly, her training boat was a ubiquitous Optimist pram. Some other parents and I were on the pier watching the children have fun learning to sail, and we wanted to try it. The instructor said we would have to take classes as a group on a bigger boat, because the Optimist was only for children. So we did, but it hasn’t been the same experience our children had, each in their own boat with the freedom to come and go, risk capsizing, and be responsible for recovery. 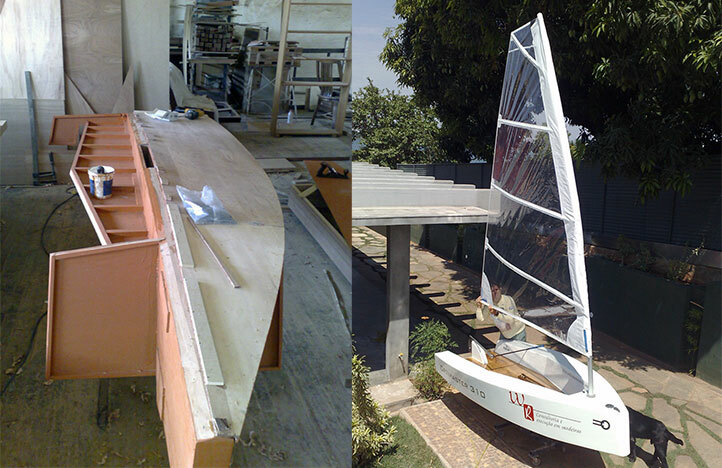 I’m an architect and designer, so I decided to study more sailboats and create a solo sail-training boat for adults. I knew the boat had to be simple and affordable to build with common materials. I wanted a project that anyone could build anywhere, without the need for boatbuilding experience. I designed a 10.2′ (3.1m) V-bottom boat that does not require a jig to begin construction. Instead, it is built around a central longitudinal structure on which the mast, daggerboard, and rudder mount. The rest of the boat is plywood/epoxy panel construction supported by some frames. For durability, I suggest sheathing the bottom and sides of the boat in a layer of fiberglass and epoxy. To keep costs low and the build simple I specified just one thickness of plywood for all components. The boat requires just five sheets of ¼″ marine plywood, a bit of lumber, and epoxy. For positive flotation, I specified that 50 empty, sealed soda or water bottles be built in between the bottom of the hull and the cockpit sole. Forward are two watertight storage compartments, port and starboard. The prow is a rubber fender to cushion and protect the boat if it runs into an obstruction or another vessel. Another advance in relation to other boats this size is the open transom, which makes it easy for the sailor to get in and out of the boat and allows water that inevitably enters the cockpit to drain quickly and easily. For economy and simplicity I adopted a windsurfer mast rig. 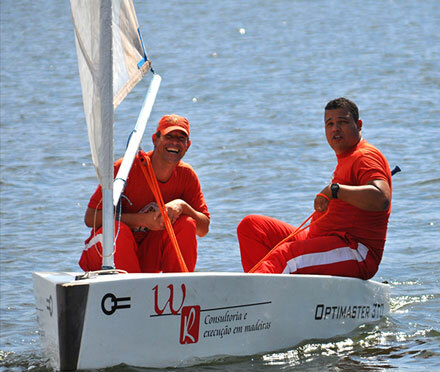 Also, the idea was to be able to employ a mast and sail from a used or discarded windsurfer. Appropriate custom sails can be built by any sailmaker. The basic sailing hardware is the same as that on a Laser and can be bought new or scavenged from discarded boats. 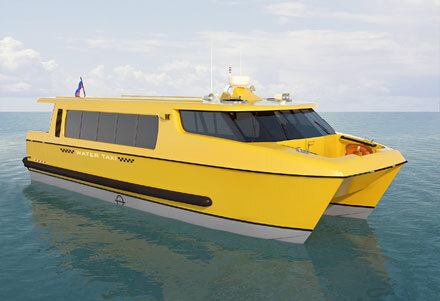 The design is intended for first-time boatbuilders and does not require any advanced skills. Plans and directions (in Portuguese) are available free of cost on the Internet. If you would like to build your own Optimaster 310, you can find many helpful ideas on the inventors’ page: http://conhecimentonauticorascx.blogspot.com/. Plans can be downloaded here.